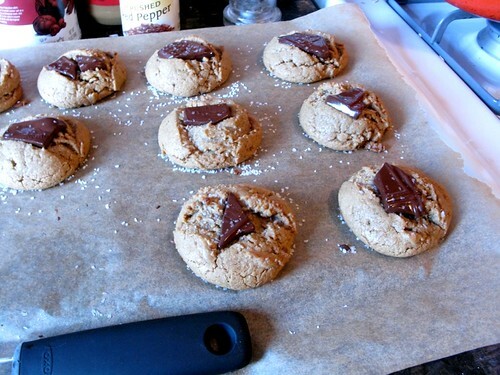 These cookies are so delightfully easy to put together, it’s the kind of recipe that it’d be worth adopting kids just to make it with them (you can give them back when you’re done). In a stand mixer, you just throw together 1 cup creamy peanut butter (use a commercial brand, “natural” peanut butter won’t work here), 1 cup dark brown sugar, 1/3 cup white sugar, 1 egg, 2 Tbs vanilla extract and a pinch of sea or kosher salt. You can add orange zest if you want, but I didn’t have any, so I left it out. You scoop the dough on to a cookie sheet lined with parchment paper (I used an ice cream scoop which made all the cookies uniform), lay a piece of bittersweet or milk chocolate on top (“don’t press down,” warns Lucy) and sprinkle everything with sea salt (I used coarse kosher salt and that worked fine) to taste (“don’t go overboard,” Lucy warns again). You bake for 10 to 12 minutes at 350 and you’re done. Let them rest for a minute then spatula them to a cookie sheet to cool. 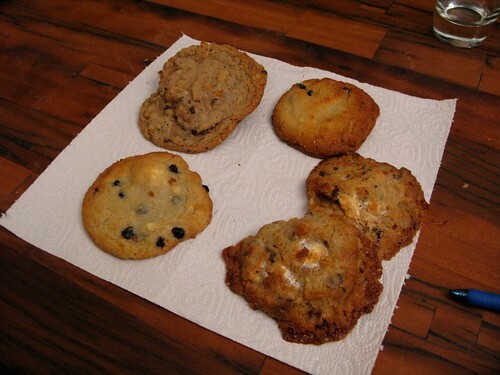 Diana brought these cookies as a special treat after we tested soup last week at The Great Soup Battle of 2010. To say that we devoured them would be a grand understatement. There was not a morsel, not a crumb to be found as we all shamelessly licked the table clean. What made those cookies so good? Once again: salt. The best cookie (you can see it on the upper left), a chocolate compost cookie (which is trademarked, by the way), has as its ingredients: pretzels, potato chips, coffee, oats, butterscotch and chocolate chips. That’s right: potato chips and pretzels in a cookie. 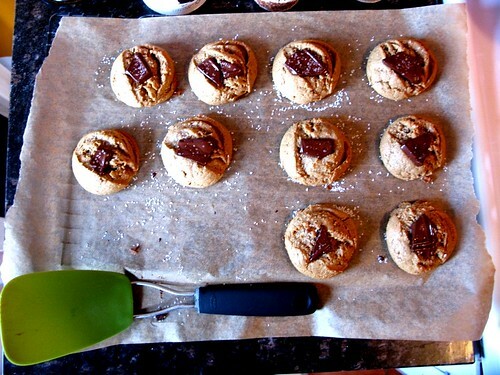 And, much like the salt sprinkled over the peanut butter cookies above, they cast a magical cookie spell. They’re insanely good. As were the cornflake chocolate chip marshmallow cookies and the blueberry cream cookies (with dried blueberries and something called “milk crumbs”). But the lesson of this post is that salt, when baking, is your friend. And salty cookies are the way of the future. For further proof of this, try these Crispy Salted White Chocolate Oatmeal Cookies: another cookie option for the weekend. Whichever cookie you decide to cookie this weekend: be brave, be bold, be salty. Just don’t tell Mayor Bloomberg.